Our ‘Caroline’ Fall-bearing Raspberries have been looking sickly recently, which prompted me to do some investigating into the cause. The plants were getting rather faded looking, the tops of the plants were showing lots of water stress – more than I expected to see even with the weather changing from very wet to hot and dry, and some of the canes were falling over and dying. 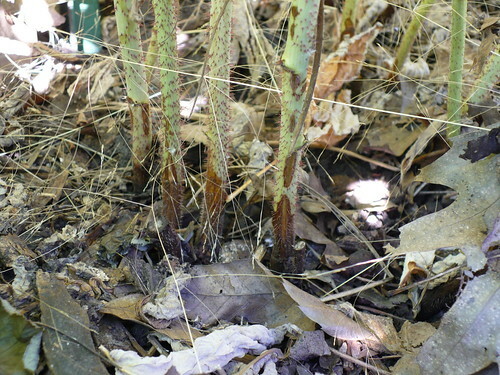 You can see some brown lesions on the canes as well as a brown area near the base of the plant. I was expecting to see lesions on the canes, but I was hoping to see anthracnose lesions, since that is fairly treatable. This didn’t look like anthracnose. I consulted with our Plant Pathology folks and then sent in a sample of a cane and part of some roots. The diagnosis? Phytophthora crown/root rot. Phytophthora is a particularly nasty organism…technically not a fungus (an oomycete), but just to make our lives easier, let’s consider it enough like a fungus to call it a fungus. Phythophthora loves wet soils and standing water. (Gee…do you see where this story is going?) Late blight of the Irish Potato Famine fame is also a type of Phytophthora. These raspberries are planted on a raised bed (although not a very good one) in clay soil that hasn’t been much amended with compost. They’ve been awesome for the last couple years, but this seems likely to be the death knell. The only fungicide available cannot be applied within 45 days of harvest, and sadly these plants are just starting to flower. We would have to try to keep the plants from fruiting, which is likely to be a challenge and also to make sure that no one came along and ate one. Not likely in this demonstration garden! So the moral of this story is to plant your raspberries in a well-drained location and don’t let it rain incessantly for a month. We will let the plants keep going and see if dry weather will let the plants recover and put up strong canes again next spring. I’m largely skeptical, but it’s possible! Posted on July 14, 2010, in Plant Problems & Diseases and tagged berries, plant diseases. Bookmark the permalink. 2 Comments.